You are here: HomenextTopicsnextTransportnextIt fell off the back of a lorry! On Sunday the 18th May 2014 at 7.45pm I was on my way home, driving along Crays Hill and approaching the double bend in the road when I saw the blue flashing lights of a police car just past the first bend. I slowed down and could see the police car parked across the road in front of me. 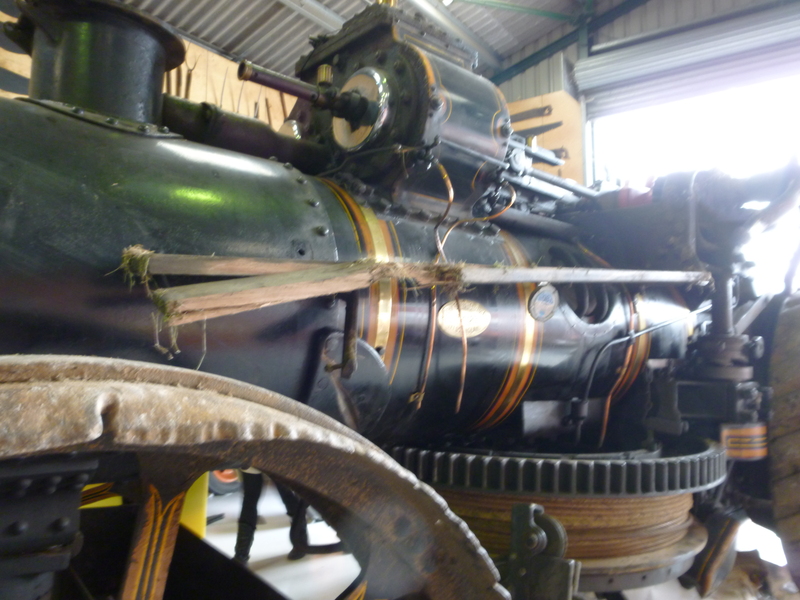 I was allowed past and laying on the grass was a traction engine. 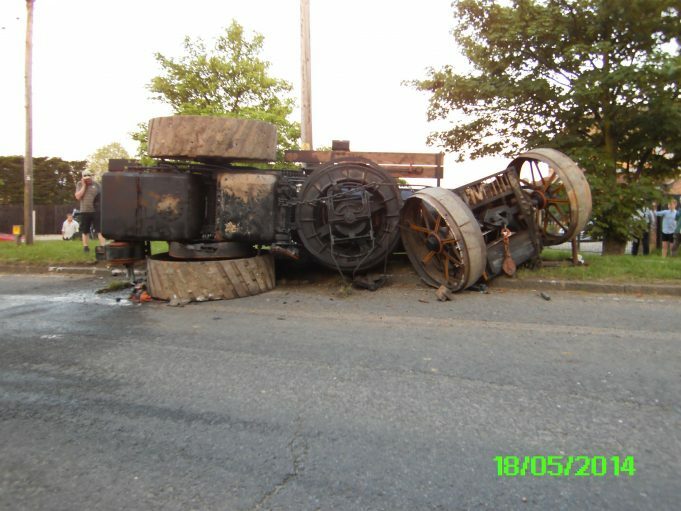 It had fallen off the low loader trailer transporting it home from a show. I carried on to the ‘Shepherd and Dog’ public house where I parked and, taking my camera, walked back to the site of the accident. There were about ten people standing round talking. I asked the police man if I could take photos. He said “Yes”, so I took these four pictures. 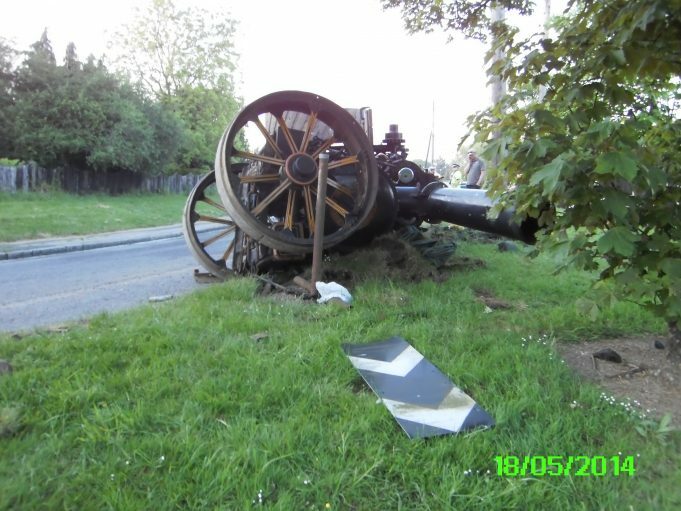 I found out afterwards that the traction engine was on its way home from a Young Farmers Show at Roxwell and returning to Barleylands. It was one of Barleylands main attractions called “The Giant Panther”. 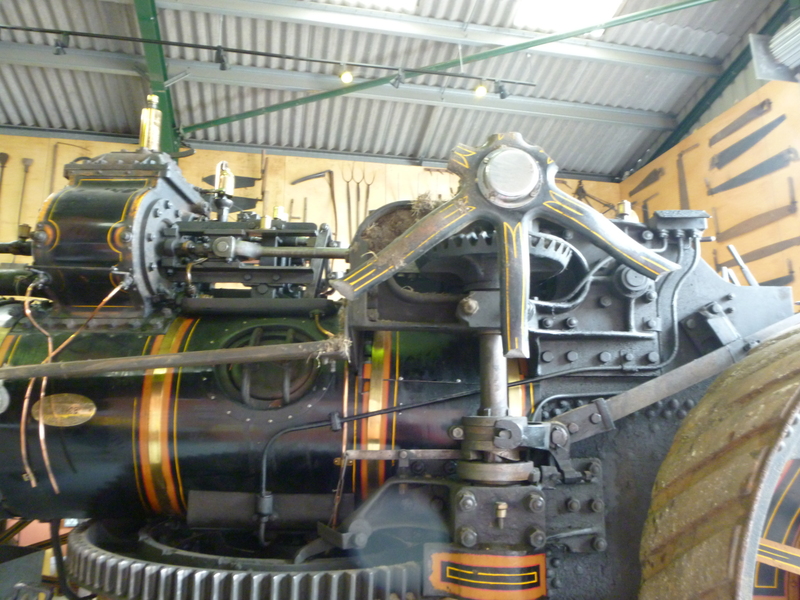 It was built in 1927 and is a Fowler Ploughing Engine. 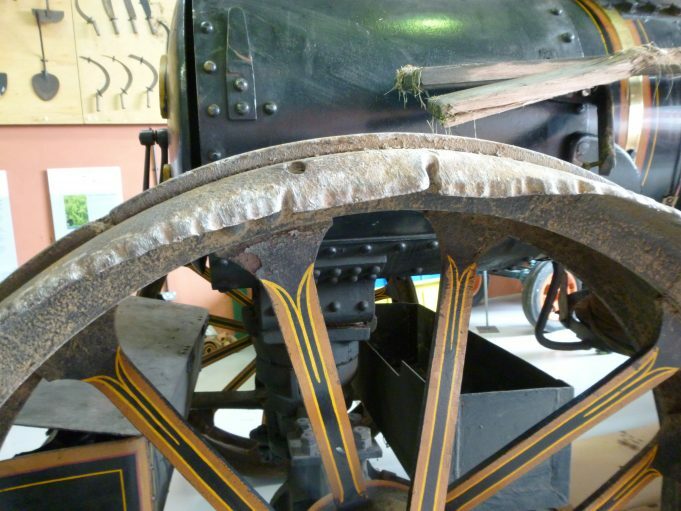 It is one of a pair which have been restored over the last few years and is regularly used in ploughing competitions at Barleylands’ Country Shows. 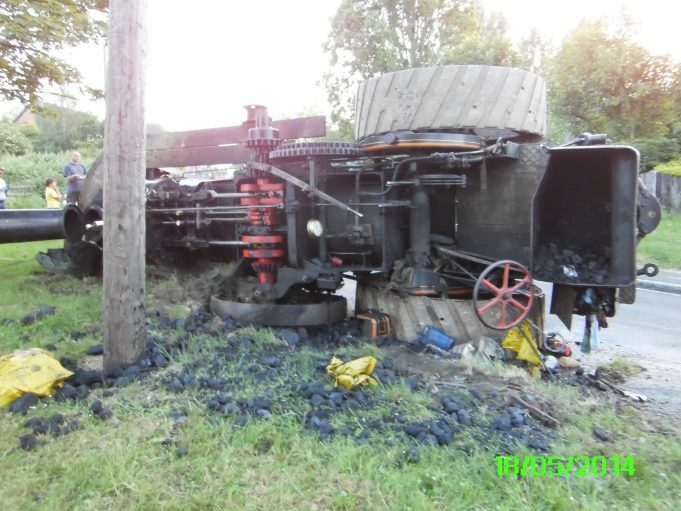 It will cost thousands of pounds to restore it. According to the Barleyland show magazine, final cost was £110,000, and this was the last big show after 30years. I spent the weekend at Barleylands Country Show in the Discovery Centre where this traction engine is stored awaiting repair. I have added photos of the more visible damage, estimated cost of repair is £100,000. That’s before the engine has been stripped and inspected for less obvious damage. 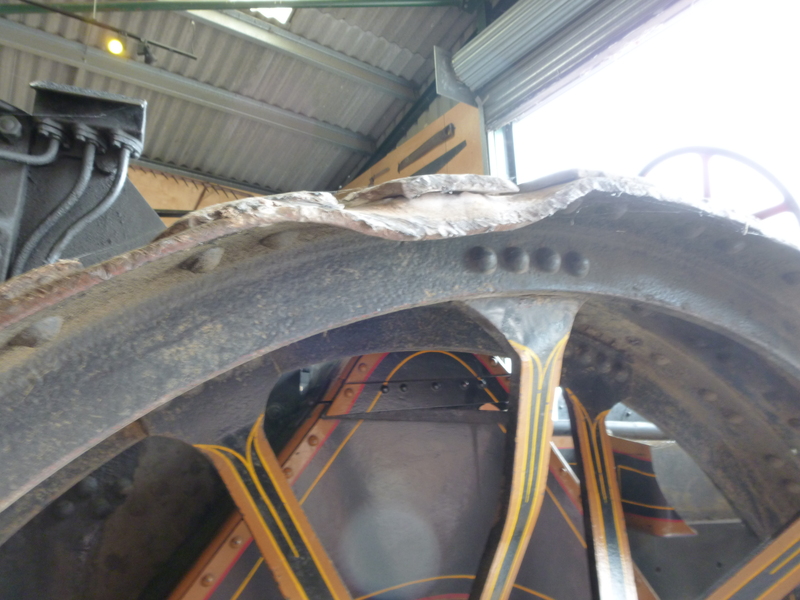 I used David’s photos to show visitors what had caused the damage to the traction engine. I had been told about this ‘mishap’ by an old mate of mine, name of JIM MUNDEN, who at some time was manager at S C Darby. For those who may recall Jim, he is now 88, living alone at Danbury, and still plays golf, off a low handicap, and still is winning the money!! Thank you so much for being in the right place to take this historic picture. 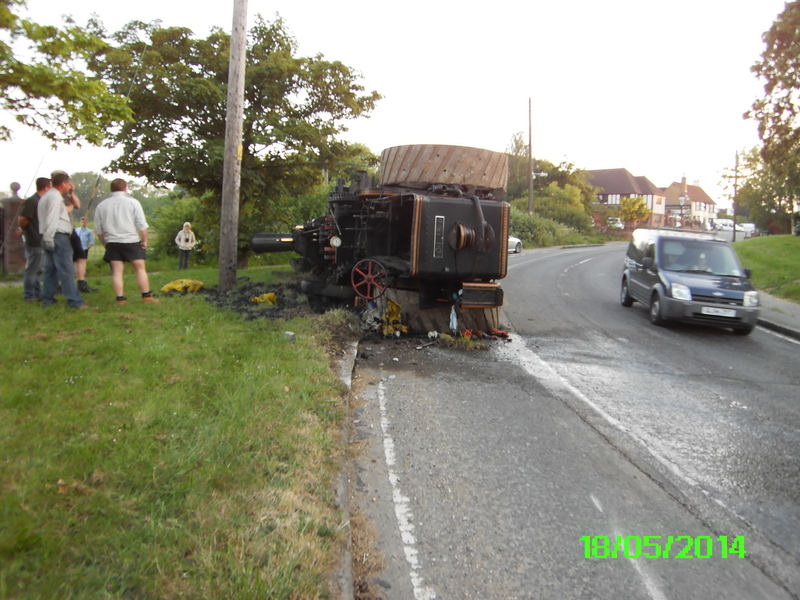 I can remember traction engines like that on the roads towing all their equipment for threshing wheat, etc. If you were on a pushbike you were lucky if you didn’t end up in a ditch, especially on going up Brock Hill, as I did in early 1950s. They used to tow three or four large trailers, like an Australian road train. I am sure they couldn’t see a poor cyclist. Then came the Field Marshal tractor which was a quarter of the size but still as dangerous when pulling the same amount of trailers.